No theme again this weekend... just going to watch whatever movie I am in the mood for at the time. It has been a long time since I seen this movie. I remember enjoying every minute of it years ago... so when this movie arrived yesterday I knew it would be the first movie I would watch this weekend. And I am so happy I didn't waited... because I forgot just how fun this movie really is. I was actually laughing through-out this entire movie. Granted... some of the jokes are a little dated. After all... this movie is 18 years old. Even though I enjoyed them... some of the jokes someone like my 13 year old daughter wouldn't get... like explaining how to record with a VCR... as all she has ever known is our DVRs. But of course anyone in their late teens and up will still get a laugh out of it. I haven't checked out any of the extras on this Collector's Edition DVD yet.... but really looking forward to listening to the commentary and checking out a few of the other extras... but why no Theatrical Trailer? A little sparse for a Collector's Edition! Mega-star Eddie Murphy (The Nutty Professor, Beverly Hills Cop series) teams with Michael Rapaport (Beautiful Girls) and Michael Wincott (The Crow) in this wildly entertaining, action-packed hit! Murphy plays Scott Roper, a fast-talking, wisecracking, on-the-edge hostage negotiator whose offbeat-but-winning style has made him San Francisco's top mediator! Roper will say...and do...absolutely anything to get his man. But when it comes to face to face with a psychotic killer who's playing a lethal game of cat and mouse, he's finally met his match! Don't miss the excitement as the always amusing Murphy packs Metro with outrageous action that has critics and audiences cheering! This is another movie I have had in my collection for a very long time... but it seems I have only watched the one time. I wouldn't say this is the best Action-Comedy I ever seen... but it is definitely enjoyable. I liked most the characters... there was lots of fun scenes... but I think there could have been a bit more comedy in the mixture for this one. Oh I know! It made me feel pretty old too! In a quiet suburban town, four young girls witness the demise of a classmate at the hands of Milo, a young boy who mysteriously disappears. Sixteen years later, the wedding of one of the four girls brings them all back to the place of their childhood trauma, only to have the horrifying nightmare of the demonic Milo return as well. This is a movie that I bought several years ago when I used to buy off of Ebay. And is one of the reasons I stopped buying from Ebay sellers. As I have reason to believe my copy of this movie is a bootleg copy. I only watched this once when I first got it... and decided to watch it again today to decide if I enjoyed it enough to replace it with a proper release. After watching it... at least at this point I am undecided about it. As this movie is little better then an average horror movie. So I am not sure if I want to put more money to this particular title. It is a pretty good idea for a story... but the actual movie didn't come out as good as it should have. Sections of the movie was rather slow... being only mildly entertaining. Made me feel old too...especially since I still don't have a DVR. Maybe this is an old technology, but those VCR were almost impossible to kill. My first VHS reader that my father had bought me in 1986 worked perfectly for 19 years (yes that long), but keep in mind that it was a very noisy and unprogrammable (at least by me) reader. Just to compare in 6 years I've already killed 3 dvd reader and my actual one doesn't have much time to live either. Oh... I believe it Jimmy... I think it is a growing trend. They don't make electronics to work for long any more... they make it so you have to keep buying them over and over again. They even seem to make it not worth repairing as most the time it is cheaper to buy new instead of repairing. Yes, but it's getting silly. Think of basic inkjet printers. Refill cartridges can cost £20 each, but at point you could buy a new printer, with cartridges, for £30. The catridges included in a new printer do have much less ink. They only last a little while. The real catridges which you buy extra have the normal filling. At least that is my experience. That is absolutely true, but I've seen offers in the past where you can get a huge discount on the ink if bought with a printer. You break even at least and now have a new printer! I worked for a HP dealer a few years ago and I can remember how obsessed our suppliers were with making sure we sold warranty with all the kit. Thing is, the warranty on a £29.99 inkjet was £60! Blade (Wesley Snipes) returns as the ultimate vampire hunter in the explosive third and final film, Blade: Trinity. For years, Blade has fought against the vampires in the cover of the night. But now, after falling into the crosshairs of the FBI, he is forced out into the daylight, where he is driven to join forces with a clan of human vampire hunters he never knew existed – The Nightstalkers. Together with Abigail (Jessica Biel) and Hannibal (Ryan Reynolds), two deftly trained Nightstalkers, Blade follows a trail of blood to the ancient creature that is also hunting him, the original vampire, Dracula. I always enjoyed the Blade franchise... all 3 of the movies. Though I never had the chance to watch the TV Series I do want to. I enjoyed this one just as much as I did the first two movies. I liked how they incorporated Dracula into the story... I also liked seeing Ryan Reynolds in this movie... not necessarily for the character he played (the character was a little aggravating to me at least)... but for the job he did in the movie. I have become a fan of his in recent years. Over-all I think if you enjoyed the first 2 movies... you should enjoy this one as well. When the original Batmobile is stolen, there's no time to call the police. This is a job for actors! 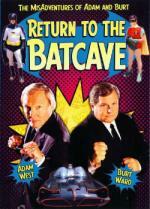 Thirty-five years after BATMAN went off the air, a fiendish criminal mastermind is forcing Adam West and Burt Ward to relive their legendary pasts as The Caped Crusader and The Boy Wonder. What went on when the costumes came off? The Dynamic Duo reveal the entire bizarre-but-true story through classic clips, surprise guest stars and THWAK!-filled flashbacks to the on-and-off camera controversies, scandals and ego battles behind one of the most wildly popular series in TV history! When I hollered out to my daughter that I was going to watch this movie she ran in here wanting to watch it with me. I figured that would be the case since she so enjoyed the '60s Batman movie when I got it not too long ago. And... I am a little surprised to say... we both enjoyed this TV Reunion Movie very much. One thing I liked was that Adam West and Burt Ward had no problem and felt like they even enjoyed making fun of themselves. It was also good seeing some of the old cast members again. As for all the flashbacks during the making of the series? I enjoyed it... thought everyone did fine with it. I wonder just how much of the behind the scenes stuff was true. One thing that bothered me though... and is nothing about the movie itself... but I read that Amy Acker (Fred on Angel) was in this movie. And I seen her name in the credits... but damn it... I didn't recognize her in the movie! I was wanting to spot her. Now that my daughter and I watched and enjoyed this movie... what is she up to? She brought the movie into the other room and is watching it again already! OK... now that I have the '60s Batman movie... and the reunion movie... really give me some nostalgic fun and bring out the series! Finally! after looking all over the net I now see that Amy Acker was play Burt Ward's wife... that left him because she didn't like the things he had to do for the series (kiss an actress). And now that I know it was obvious... don't know why I didn't see it before. And... I am a little surprised to say... we both enjoyed this TV Reunion Movie very much. One thing I liked was that Adam West and Burt Ward had no problem and felt like they even enjoyed making fun of themselves. This is also what I liked so much about this movie. And if you enjoyed Adam West as a dimwitted version of himself here, I can recommend the short-lived live-action The Tick series. Adam West reminded me very much of Patrick Warburton's potrayal of The Tick. As for all the flashbacks during the making of the series? I enjoyed it... thought everyone did fine with it. I wonder just how much of the behind the scenes stuff was true. As far as I know most of the stuff in the flashback is based on the reality. A lot of stuff is taken from their own autobiographies.